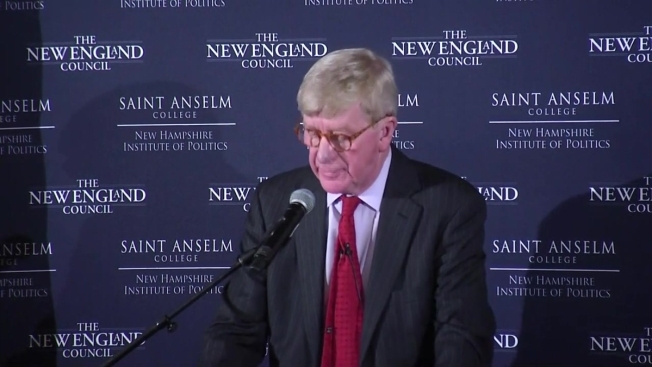 William Weld, a former governor of Massachusetts who two years ago ran for vice president on the Libertarian Party ticket, has become the first Republican to announce serious step toward challenging to President Donald Trump in the 2020 primaries. Fiscally conservative but socially liberal, the 73-year-old Weld ran on the Libertarian party ticket with former New Mexico Gov. Gary Johnson. But he re-registered as a Republican last month, and on Friday in New Hampshire said he has created a presidential exploratory committee. While speaking to voters at the Politics and Eggs event at the Bedford Village Inn, Weld said Trump's priorities are skewed toward promoting himself and is "simply too unstable" to carry out the duties of his job. "I'm here because I think our country is in grave peril and I cannot sit any longer quietly on the sidelines," Weld said. He said Trump "has demonstrated a repeated pattern of vindictiveness -- there's really no other word for it. He calls it counterpunching, but it's really vindictiveness. He acts like a schoolyard bully. "The truth is we've wasted an enormous amount of time by humoring this president, indulging him in his narcissism and his compulsive, irrational behaviors," he added. The former federal prosecutor expressed concerns over what he called outrageous spending and the growing national debt. He wants to see less government intervention in health care and education but says more needs to be done when it comes to climate change — a notion popular with younger voters in the room. "It's nice to hear a candidate talk about climate change that's not a Democrat,” said Saint Anselm College junior Jack Landry. Weld, who said he would be a Libertarian for life when he was that party's vice presidential candidate in 2016, recently switched his affiliation back to republican raising questions about his loyalty. "It bothers me you left the party, ran for VP, and came back," one voter told Weld. Weld responded by pointing to his record governing of Massachusetts. "The result was when we ran for reelection, we got 71 percent of the vote," Weld said. "If you like those apples, you shouldn’t worry about what I would do if I get to Washington." When asked exactly why Weld switched party affiliations, he told reporters the stakes have gotten higher and this is the best way for him to do what’s right for the country. He added that many of his Libertarian friends agree with him. "A couple people have said, 'how dare you do this,' but five times as many have said, 'we are with you,'" Weld explained. Critics say a Weld primary challenge is a longshot. But Weld says over the next year, he plans to prove himself, one voter at a time. Weld resigned as governor in 1997, during his second term, after being nominated by then-President Bill Clinton as ambassador to Mexico.